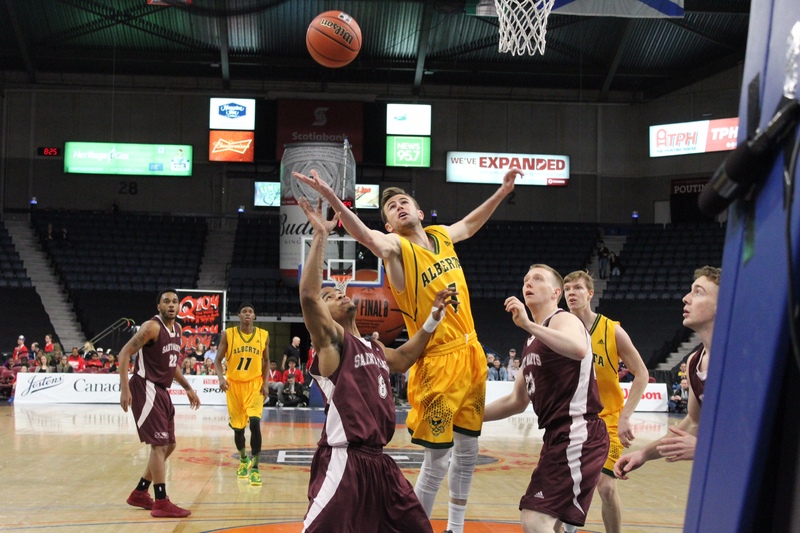 Following losses in Thursday’s quarterfinals of the U SPORTS Men’s Basketball Final 8, the first consolation semi-final was a rematch of the Canada West Final Four with the University of Calgary Dinos playing the University of Manitoba Bisons on Friday evening. The Dinos fell to the second-seeded Carleton Ravens by a score of 85 – 69, and Manitoba lost to the McGill Redmen by ten points in a 63 – 53 loss. The first quarter saw Manitoba take the early lead, with the Bisons up 11 – 0 before the Dinos had their first basket. Calgary closed the gap by the end of the first, trailing the Bisons by a score of 22 – 20. Barely three minutes into the second quarter, the Bisons extended their lead to 35 – 22, with many of those points coming from veteran players AJ Basi and Keith Omoerah. With under a minute left in the second frame, Jasdeep Gill lead the charge as the Dinos tied the Bisons at 40 points apiece, ending the quarter up 43 – 42 on Manitoba. The Bisons struck first in the third quarter, with AJ Basi putting the team up 44 – 43 before a quick basket from Calgary shifted the lead yet again. The Dinos controlled much of the play in the third, and the quarter ended with Calgary up by three with a score of 69 – 66 after Manitoba clawed back in the final few minutes. The fourth quarter started off slowly, with just a single basket from Calgary in the opening minute. The Dinos would retain their lead throughout the final frame, taking the win 92 – 84. Following the game, Calgary’s Dan Vanhooren credited his team for coming back after a slow start to take the win. The Saint Mary’s Huskies took on the University of Alberta Golden Bears after the Manitoba/Calgary tilt in the second consolation semi-final. The Huskies’ valiant effort against Ryerson the previous evening fell short by nine points, and Alberta lost in a thrilling match against Dalhousie by a single basket – made by the Tiger’s Kashrell Lawrence with just 1.4 seconds left on the clock. The hometown Huskies trailed the Golden Bears in the first quarter after a strong start by Alberta, but came back from a 6 – 0 deficit to take the opening ten minutes by a score of 21 – 16. Saint Mary’s Theon Reefer lead the team in points in the first with seven, including going four for four on free throws. Saint Mary’s retained the momentum – and the lead – for most of the second quarter, taking advantage of the Golden Bears’ many turnovers. With 36 seconds left, Alberta got one up on the Huskies to lead 41 – 40, and the quarter ended with Saint Mary’s falling behind by a single point, with 42 to Alberta’s 43. There was plenty of back and forth in the third quarter, with the lead swapping virtually every time one of the teams got a basket. A string of three pointers helped the Huskies pull ahead, but it was a narrow lead exiting the penultimate frame with Saint Mary’s up 68 – 64. The fourth quarter was tight, with neither team really getting the go ahead until later on when the Golden Bears took the lead. With four seconds left in the game, the Huskies’ Marquis Clayton made a three to tie the match at 87 apiece. Clayton proved to be instrumental again in the five minute overtime, hitting two more threes to give the Huskies a six point lead with a minute and forty seconds left in the added time. At the end of overtime, it was the Huskies toppling the Golden Bears by a final of 98 – 93. The Huskies will go on to face the Dinos at 8p.m. Saturday evening in the consolation final.